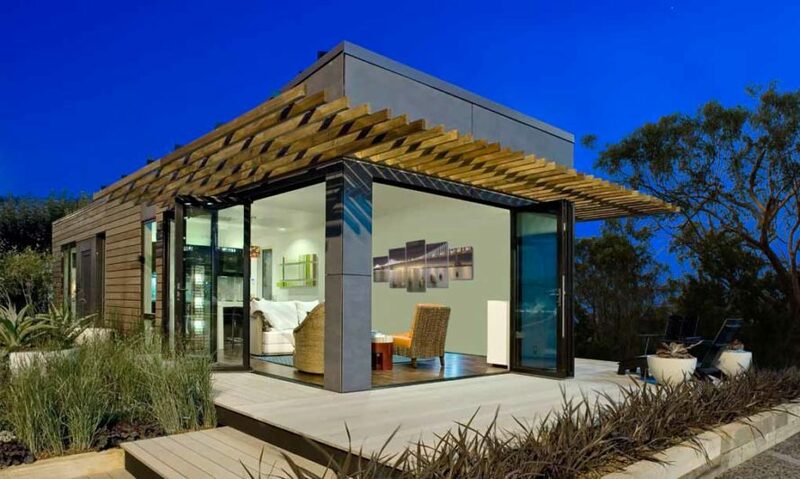 As a dynamic force in the prefabricated green building industry, Blu Homes has consistently been pushing the boundaries of prefab home design for many years. 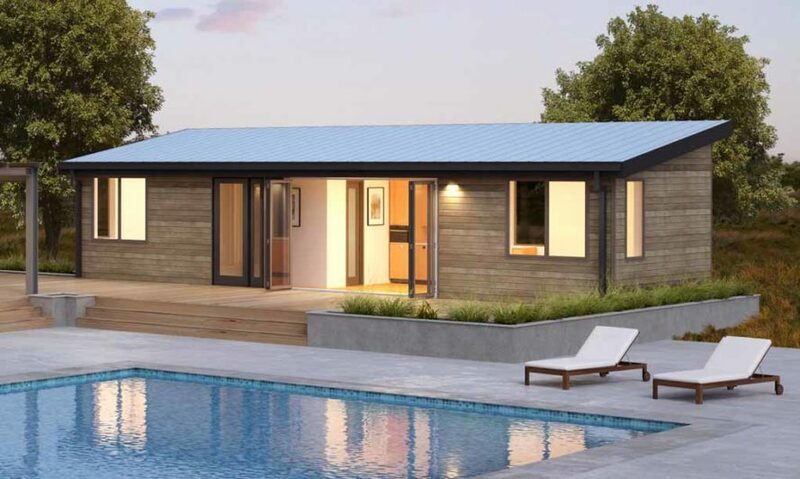 That’s why we’re excited to announce that the California-based prefab home manufacturer is unveiling a bunch of new house designs in a wider variety of sizes including some new tiny homes and a charming prefab farmhouse. Inhabitat visited their historic 250,000 square-foot factory in Vallejo, Northern California to get the scoop. Read on for the exclusive details. Inhabitat has been covering Blu Homes ever since it was a newcomer on the prefab scene in 2008. We’ve watched their designs develop and evolve, as they moved operations from the East Coast to the West coast, acquired green prefab architect Michelle Kaufmann’s designs and tiny home builder Modern Cabana, and established themselves as the prefab home industry leader behind the now iconic Breezehouse. The upscale prefab home industry that Blu Homes leads is a relatively new and rapidly evolving space. Manufactured housing has long been popular as an affordable way to construct inexpensive homes, but high-end modern green prefabricated houses have really only started to gain traction in the past decade. Many builders have seen the potential efficiencies of moving home construction indoors, into factories, but have struggled to find the right scale for efficiency, and to deal with the unique customization issues that each customer and site requires. Over the years at Inhabitat, we’ve seen a number of promising prefab home companies launch with beautiful and elegant designs, only to shutter their businesses a few years later. But with 225 completed homes sold so far, Blu Homes seems to have found the recipe for success in this complicated industry. The reasons for building homes inside a factory are many: climate-controlled factories allow for a much higher level of precision in manufacturing, than a rotating crew working outside over many weeks to cut and attach 2X4s through a wide variety of weather (including rain that warps wood and joints). Factories that are set up with an assembly-line allow for standardization and systemization of materials and labor, creating cost efficiencies and faster time to finished product. 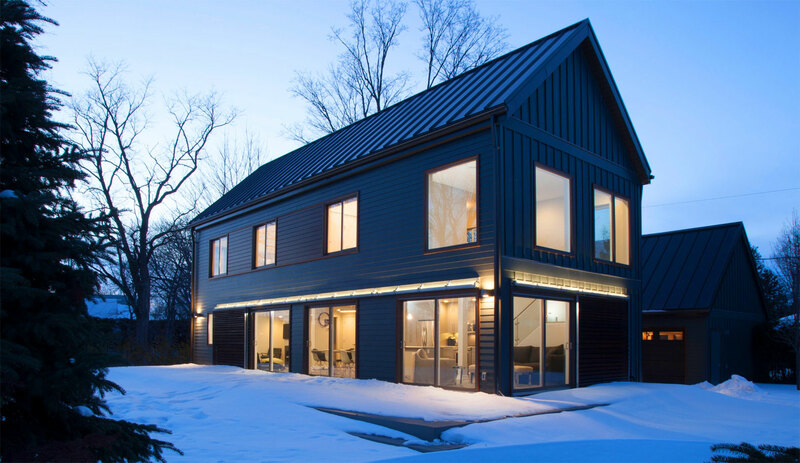 For homeowners concerned about energy-efficiency, you need a tightly sealed, well-crafted house in order to lower monthly energy bills and meet Net Zero or Passive House requirements. This type of super-insulated, super-sealed building is far easier to manufacture inside of a factory, where highly insulative SIPs (structural insulation panels) are easy to create in a standardized form. 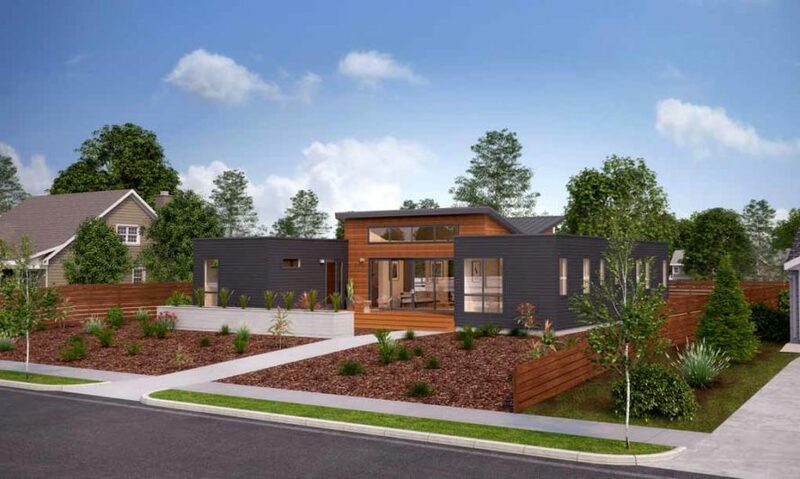 For all of these reasons, prefab building is becoming an increasingly popular way to get a Net Zero Energy home, a green home or a tiny home. And many customers are interested in a prefab home simply because it is a great way to get their home built faster, better and for a lower price point. With a growing clientele and 225 built homes to date (in 31 states and Canada), Blu Homes has expanded their line to include sixteen models (plus a series of garages), a move that’s sure to impress customers who are looking for greater options in prefabricated homes. 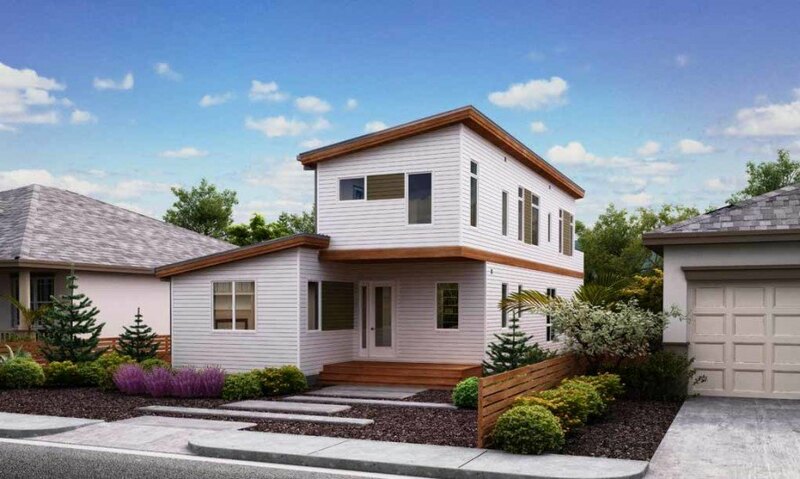 All sixteen homes leave their Mare Island, Vallejo factory LEED Silver certifiable and solar power ready, with the option of Net Zero Energy status- a wise move since California is mandating all new homes to be net zero energy by 2020. Blu Homes come standard with non-toxic finishes, eco-friendly fixtures and energy-efficient appliances, locally sourced materials, airtight construction, and a 30% lower water footprint than most homes. Typically their prefab homes take twenty-four weeks to complete, which is roughly half the time it takes to complete a conventional custom home. To help us navigate the new line Blu has organized the new home designs into three categories: the mini homes, the new designs, and the updated icons. Blu Homes acquired Inhabitat favorite Modern Cabana in 2011 with an eye to expand their presence in the Tiny Home market. Now they’re rolling other sizes of “Cabanas” (400-840 square feet) and two sizes of the “Lotus” (640-1600 square feet). Both make popular guesthouses, studios, and stand alone tiny homes, though the Cabana offers the smallest footprint of the new line and the Lotus focuses more on indoor/outdoor living with optional folding glass walls and decks. The Cabana (640 sq. ft) and Cabana Mini (400 sq. 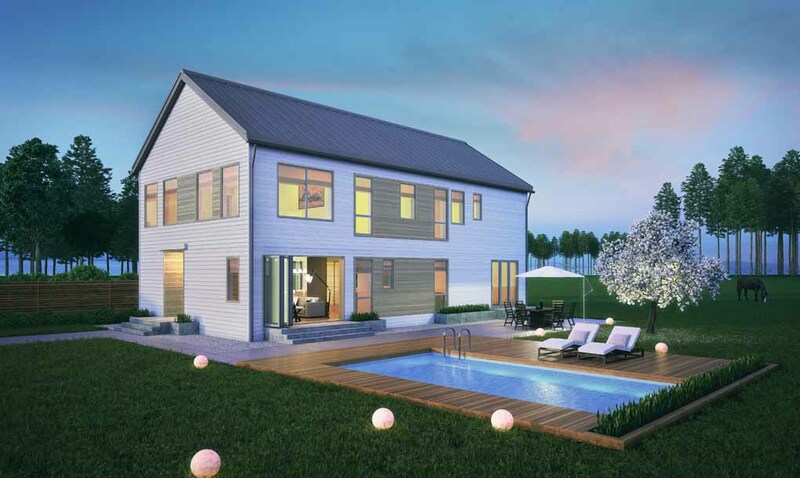 ft.), starting at $235,000, provide the smallest footprints of Blu Home’s new designs. These studio-style structures offer flexibility for home expansion and can even function independently as tiny homes. Blu Homes also offers a larger Cabana Plus (840 sq. ft) which comes in 1 or 2 bedroom configurations, making it the ideal choice for a bachelor pad or granny flat. We can’t believe its been almost 10 years since Inhabitat first broke the news on the Zero Energy Prefab “Lotus Home” back in 2007, when it made it’s debut on the lawn of San Francisco City Hall. We even interviewed the original designer of the Lotus, Michelle Kaufmann, on the green roof! It is satisfying to see this gorgeous house finally available in mass-production now through Blu Homes, starting at $275,000. At 640 sq. ft., the Lotus Mini Home is the same size as the Cabana Plus, though it boasts a more modern and luxurious take on the “tiny home” concept, with California Closets and features like wine fridges. Those desiring more space might be drawn to the full sized 1,600 sq. ft. Lotus Home with two bedrooms – one at each end of the house – and folding glass walls that invite the outdoors in. We’re particularly excited about Blu Home’s new designs, including a charming new “Modern Farmhouse” that blends modern design with a traditional, vernacular house shape. Blu Homes has also launched an updated version of the Eichler-inspired “Aire” (2600 square feet), and a modified version of the “Solaire” (2450 square feet). The two-story 2,000 sq. 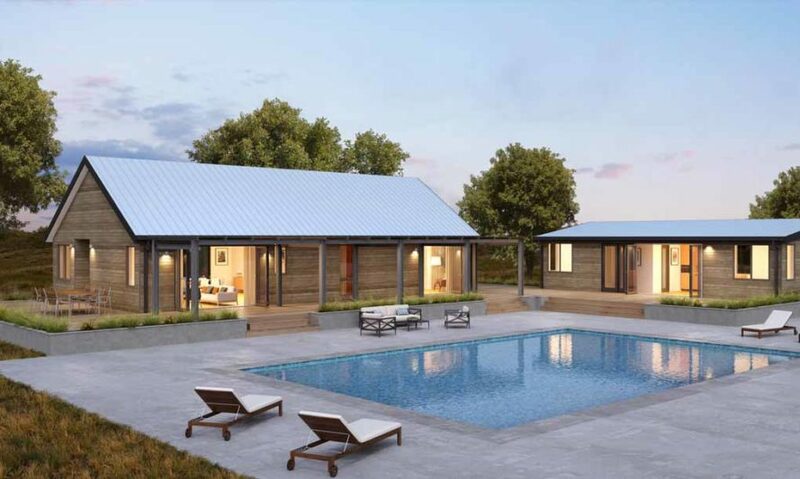 ft. Modern Farmhouse draws inspiration from California’s rich farming history and blends a classic gabled roof with modern, California home design. Featuring 3 bedrooms, 3 baths, an office nook, and a high ceilinged, open living plan, the Farmhouse is perfect for families who appreciate ample storage space, with a starting price of $745,000. The Farmhouse Mini is a smaller 1,600 sq. ft. version of the Modern Farmhouse with the option of 2 or 3 bedrooms, but still features an open living plan and the signature attic loftspace. Like all versions of the Farmhouse, the Mini also offers the option of folding window walls to experience indoor/outdoor living. The Farmhouse Plus, at 3,200 sq. ft. is the biggest version of the Farmhouse with 4 and 5 bedroom configurations, 4 baths, and a large office and workspace. And of course, that signature “Farmhouse” loftspace. The single story Eichler-inspire Aire home embraces open-plan living with a double-sized Breezespace and spacious kitchen and dining area, in 2,600 sq. ft. A private bedroom wing and dedicated office nook provide the necessary space to recharge and recollect. The two-story, 2,400 sq. ft. Solaire Home makes copious use of natural light, and is designed for urban living with roof decks, 3 bedrooms, an office, and an open living plan. 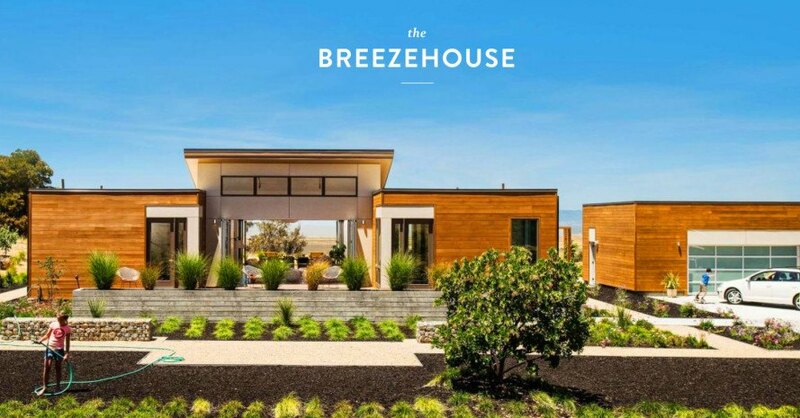 The Breezehouse has long been Blu Home’s most popular and iconic house design, and now the company is offering it in a much wider variety of sizes, configurations and footprints, starting at $965,000. The Breezehouse, originally designed by Michelle Kaufmann in 2005 and acquired by Blu Homes in 2009 is an icon of modern residential design. Featuring an open floor plan of 3400 sq. ft. and 4 bedrooms, with copious windows and expanding glass doors to open the interior of the house to the outside, the Breezehouse is designed for indoor/outdoor California living. 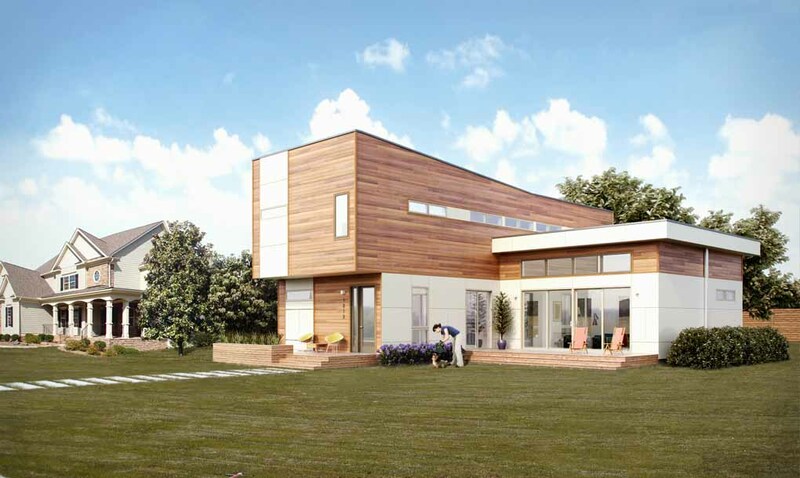 The Breezehouse Mini is a smaller version of the iconic modern prefab Breezehouse, at 2,000 sq. ft. and 3 bedrooms. The Breeze Plus Home, at 4,300 sq. ft., is exactly what it sounds like – a super-sized version of the iconic green prefab home. For those who need more space, the Breeze Plus Home is the largest version of the Breezehouse yet, and includes a dedicated media room / library, spacious master bedroom, and huge corner kitchen. The Sidebreeze is basically a 2-story Breezhouse compressed into a smaller footprint for urban infill lots. At 3450 sq ft, it has 4 bedrooms, a roof deck, and a generous open “Breezespace”. The Sidebreeze Max is gigantic – for large families or families who want to live large. At 5950 sq ft, this supersized abode provides all the perks of the Sidebreeze, with the addition of a whole extra wing. The potential for seven bedrooms or extra office space make the Sidebreeze Max Blu’s biggest home yet. Blu Homes new home designs not only feature lower prices per square foot, but also offers more size options and design configurations which can be replicated online in 3-D before building. Blu Homes’ detailed software even allows users to move their prospective homes onto virtual versions of their lots, allowing them to manipulate placement for optimal thermal shading, cooling, and other site-specific advantages. 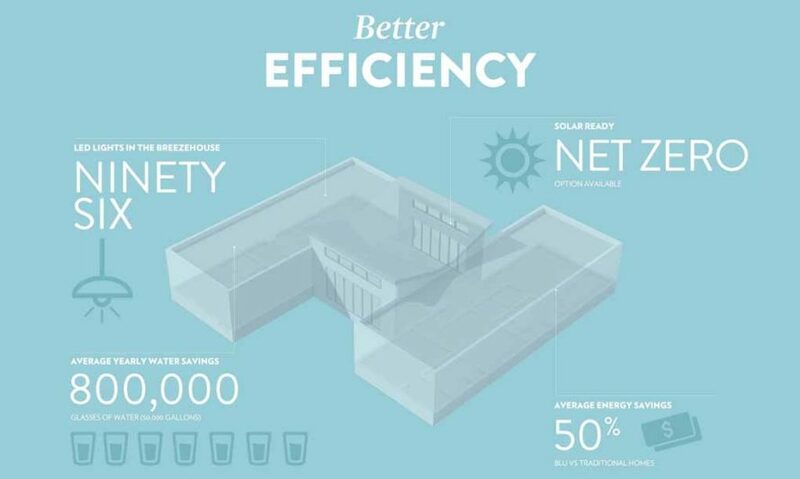 Coupling their dedication to creating a product line that is both green and healthful, with goals to be net zero by 2018, Blu is well on their way to transforming the home building industry as we know it today. On their website it says the the 640 square foot lotus home starts at 425k...... that is completely insane. Te houses are beautiful and I am always looking for small home advances and I like the frebab idea.....BUT these prices are insane. Why would I go for the pre designed pre fab option if I can get custom made to my precise needs, built from scratch, for a fraction of the price. well written and very informative. Really enjoyed the article. I took a look at their web site. If these are priced like the current line, they're not very affordable. "affordable" is in the title, but no mention of price in the article? Thanks? As a dynamic force in the prefabricated green building industry, Blu Homes has consistently been pushing the boundaries of energy efficiency and design for many years. That's why we're excited to announce that the California based prefab home manufacturer is unveiling a bunch of new house designs in a wider variety of sizes and at dramatically lower price points than ever before. Inhabitat visited their historic 250,000 square-foot factory in Vallejo, Northern California to get the scoop. Read on for the exclusive details. Inhabitat has been covering Blu Homes ever since it was a newcomer on the prefab scene in 2008. 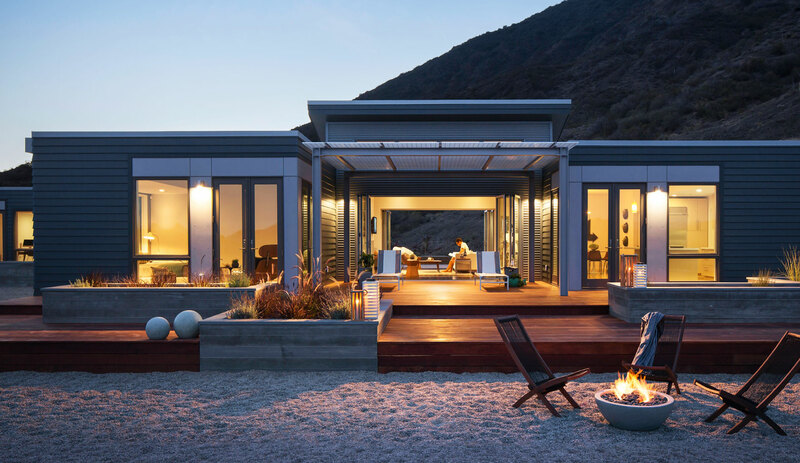 We’ve watched their designs develop and evolve, as they moved operations from the East Coast to the West coast, acquired green prefab architect Michelle Kaufmann's designs and tiny home builder Modern Cabana, and established themselves as the prefab home industry leader behind the now iconic Breezehouse. 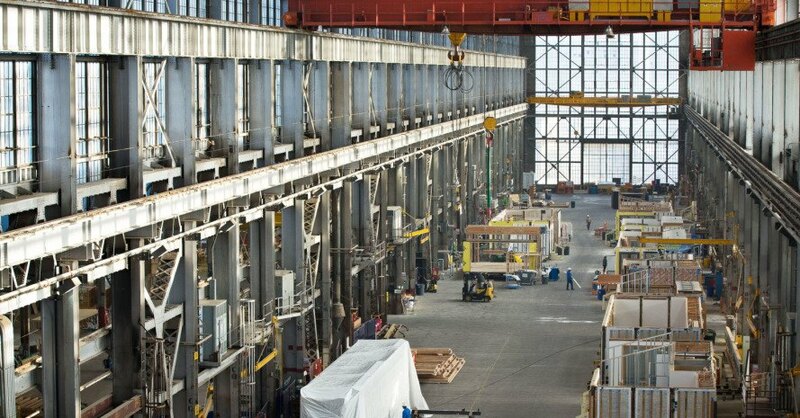 Blu Homes prefab houses are constructed at this 275,000 square feet building on Mare island. An interior view of Blu Homes factory in Vallejo, CA. During WW2 this historic old building was used to manufacture submarines. Much of Mare Island was abandoned and in disrepair - including this old factory - until Blu Homes rehabilitated it to turn into their home-producing factory. This historic space contains several unique features which are still used today, such as cranes from 1939. All sixteen Blu Homes leave their Mare Island, Vallejo factory LEED Silver certifiable and solar power ready, with the option of being set up to achieve net zero energy status- a wise move since California is mandating all new homes to be net zero energy by 2020. ypically their prefab homes take twenty-four weeks to complete, which is roughly half the time it takes to complete a conventional custom home. The Cabana (640 sq. ft) and Cabana Mini (400 sq. ft.) provide the smallest footprints of Blu Home's new designs. These studio-style structures offer flexibility for home expansion and can even function independently as tiny homes. The larger Cabana Plus (840 sq. ft) is available in 1 or two bedroom configurations making it the ideal choice for a bachelor pad or granny flat. At ~640 sq. ft., the Lotus Mini is the same size as the Cabana Plus, though it boasts a more luxurious take on the “tiny home” with options to customize storage from California Closets and features like wine fridges for the perfect wine country accessory dwelling unity. Those desiring more privacy might be drawn to the full sized ~1,600 sq. ft. Lotus with more space between its 2 bedrooms and shared spaces and folding glass walls that allow for indoor/outdoor living. The two-story 2,000 sq. ft. Modern Farmhouse draws inspiration from California’s rich farming history and blends a classic gabled look with modern, California inspired design. Featuring 3 bedrooms, 3 baths, an office nook, and a high ceilinged open living plan, the Farmhouse is perfect for families, particularly those who appreciate ample storage space. The Farmhouse Mini is a smaller 1,600 sq. ft. version of the Modern Farmhouse with the option of 2 or 3 bedrooms, but still features an open living plan and the signature attic loftspace Like all versions of the Farmhouse, the Mini also offers the option of folding window walls to invite the outdoors in. The Farmhouse Plus, at 3,200 sq. ft. is a larger version of the Farmhouse with 4 and 5 bedroom configurations, 4 baths, and both a large office space and workspace. And of course, it wouldn’t be complete without its "signature Farmhouse loftspace." The single story 2,600 sq. ft. Aire embraces openness with a double-sized Breezespace and spacious kitchen and dining area while a private bedroom wing and dedicated office nook provide the necessary space to recharge and recollect. Abundant glass and a canted roofline (ideal for solar) is sure to make the Solaire home stand out in any neighborhood. The Breezehouse, originally designed by Michelle Kaufmann in 2005 and acquired by Blu Homes in 2009 is an icon of modern residential design. Featuring an open floor plan of 3400 sq. ft. and 4 bedrooms, with copious windows and expanding glass doors, the Breezehouse is designed for indoor/outdoor living. In this photograph of a living room in the center of Breezehouse, you can see how spacious and "breezy" the floorplan feels, with the high ceilings and clerestory windows. A photograph of the interior dining table room in a Breezhouse, with ample natural light and visual connections to outdoor space. The Breeze Plus Home, at 4,300 sq. ft., is exactly what it sounds like - a super-sized version of the iconic green prefab home, the Breezehouse. For those who need more space, the Breeze Plus Home is the largest version of the Breezehouse yet, and includes a dedicated media room / library, spacious master bedroom, and huge corner kitchen. The Sidebreeze is basically a 2-story Breezhouse compressed into a smaller footprint for urban infill lots. At 3450 sq ft, it has 4 bedrooms, a roof deck, and a generous open "Breezespace". The Sidebreeze Max is gigantic - for large families or families who want to live large. At 5950 sq ft, this supersized abode provides all the perks of the Sidebreeze, with the addition of a whole extra wing. The potential for seven bedrooms or extra office space make the Sidebreeze Max Blu’s biggest home yet. As a dynamic force in the prefabricated green building industry, Blu Homes has consistently been pushing the boundaries of prefab home design for many years. 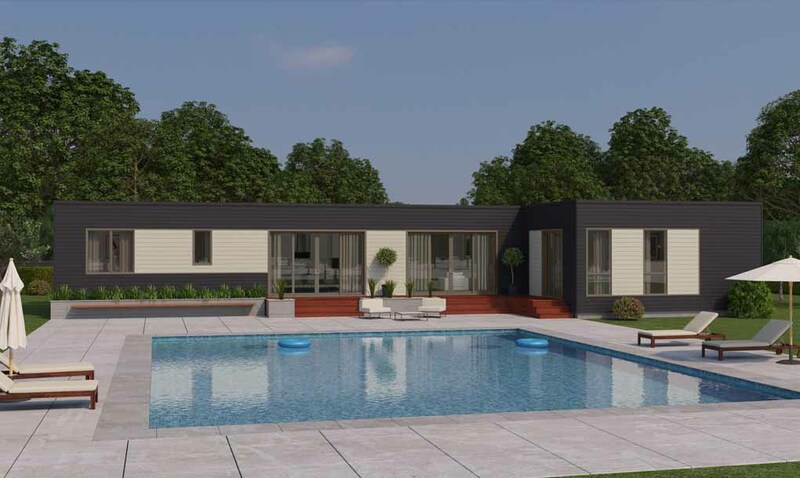 That's why we're excited to announce that the California-based prefab home manufacturer is unveiling a bunch of new house designs in a wider variety of sizes including some new tiny homes and a charming prefab farmhouse. Inhabitat visited their historic 250,000 square-foot factory in Vallejo, Northern California to get the scoop. Read on for the exclusive details. Blu Homes' mission is "to provide home buyers and institutions worldwide with green buildings that are beautifully designed, high quality, healthy, and economical." The tiniest member of the Inhabitat team (Fehren) helps us check out the new design. He explores the very inviting kids bedroom in Blu Homes' model show home Breezehouse in Vallejo, CA.